About 5% of the U.S. population, or 15 million persons, are Asian. The Asian population is heterogeneous, characterized by a variety of languages, cultures, socioeconomic statuses, and health issues. A new NCHS report looks at the health status, multiple chronic conditions, serious psychological distress, and limitations on work or social participation for all non-Hispanic Asian adults and the six largest Asian subgroups: Chinese, Filipino, Asian Indian, Japanese, Vietnamese, and Korean. Estimates for all U.S. adults are also shown. Non-Hispanic Asian adults were less likely than all U.S. adults to be in fair or poor health, have multiple chronic conditions, have serious psychological distress in the past 30 days, or be limited in work or social participation. Chinese adults reported better health on all five measures in this report compared with all U.S. adults. Chinese adults (11.3%) were less likely than Filipino (22.3%), Asian Indian (16.9%), Japanese (16.8%), or Vietnamese (15.6%) adults to have multiple chronic conditions. Chinese (1.8%) and Asian Indian (1.5%) adults were about one-half as likely as Japanese adults (4.1%) to have a work limitation. Chinese (2.4%), Japanese (2.2%), and Vietnamese (2.4%) adults were about one-half as likely as Korean adults (4.6%) to be limited in social participation. Adolescence is a critical period for health promotion, disease prevention, and the development of healthy habits. Regular preventive health care visits during this period are recommended to promote health and quality of life. An NCHS report examines recent trends and demographic differences in the percentages of adolescents with a usual place for preventive care; those who had a well-child checkup in the past 12 months; and those who had a dental visit in the past 12 months. The percentages of adolescents aged 10–17 who did not have a usual place for preventive care, did not receive a well-child checkup in the past 12 months, or did not have a dental visit in the past 12 months decreased from 2008 to 2014. In 2014, 2% of adolescents aged 10–17 did not have a usual place for preventive care, 21% did not receive a well-child checkup, and 12% did not have a dental visit in the past 12 months. In 2014, the percentages of adolescents not having a usual place for preventive care, not receiving a well-child checkup, and not having a dental visit were higher for those aged 16–17 compared with those in younger age groups. These percentages also varied by race and ethnicity, poverty status, and insurance status. Between 2013 and the first 9 months of 2015 almost 15 million adults aged 18–64 gained health insurance coverage in the United States. In monitoring the effects of this shift in coverage, one population of special interest is those with mental health conditions. Previous studies have shown adults with mental health conditions have greater health care needs and are at higher risk for poor health outcomes, but may have reduced access to services. 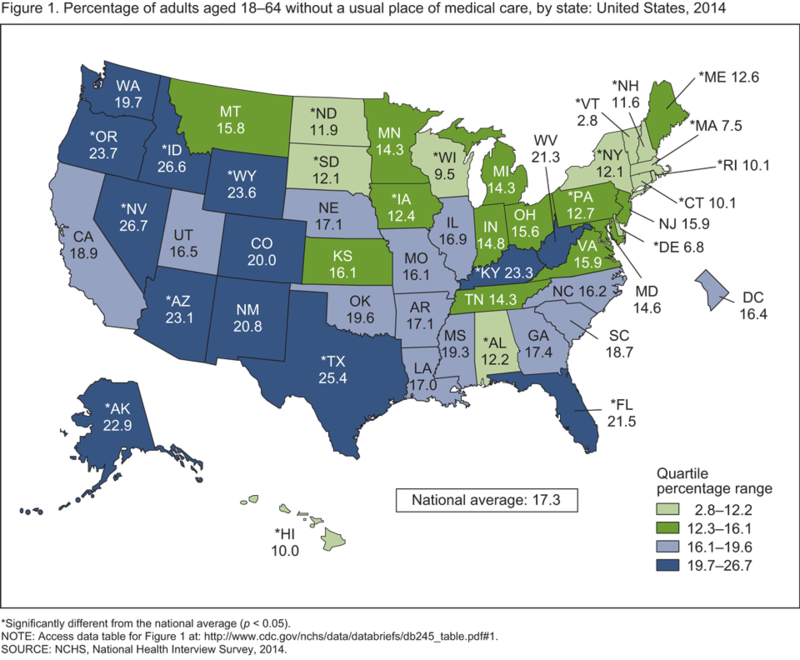 A new NCHS report provides estimates of health care access and utilization for adults aged 18–64 with and without serious psychological distress in the past 30 days, an indicator of mental health problems severe enough to cause moderate-to-serious impairment in social, occupational, or school functioning and to require treatment. Estimates were based on data from the National Health Interview Survey for January 2012 through September 2015. Among adults aged 18–64 with serious psychological distress, the percentage who were uninsured decreased from 28.1% in 2012 to 19.5% in the first 9 months of 2015. Adults without serious psychological distress saw a decrease in the percentage of uninsured from 20.3% in 2012 to 12.3% in the first 9 months of 2015. You are currently browsing the NCHStats blog archives for May, 2016.